You will be immersed in the ancient warrior world of Genghis Khan, ruler of the Mongol Empire, in the depths of nomadic Northeast Asia. 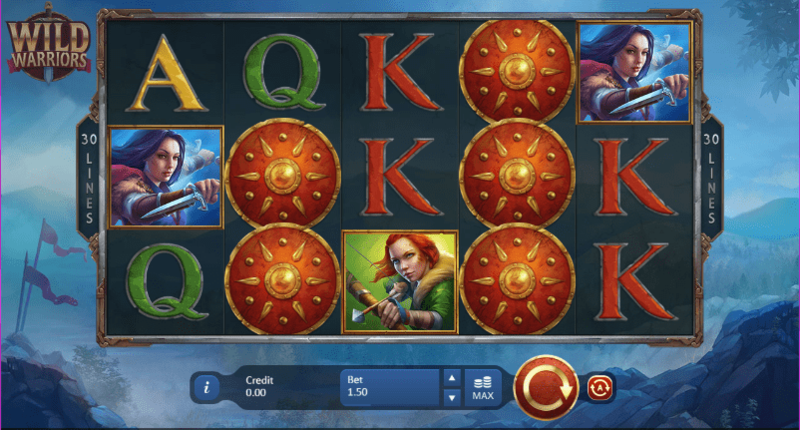 If you are a history fan, this slot game is a bit of you, as you will be transported back to the 13th Century where you will triumphantly defeat the enemy with your army of mighty warriors by your side and revel in your spoils. Take battle on the reels and become a fearless warrior in your quests to win treasures beyond your wildest ambitions in this exciting, oriental themed casino slots 3D that will get your adrenaline pumping. Wild Warriors is brought to you by Spin Games, who are well known for their classic themed games and their passion for creating a UK online slot game that players will love to play time and time again. Spin Games is well versed in delivering timeless classic games with historic themes and have amassed considerable expertise in executing these games perfectly. Their roots are in developing games for land-based casinos but have transitioned well to providing great online slot games. Wild Warriors is an oriental themed slot gate comprising 5 reels, 4 row and is played across 40 paylines which can be adjusted to suit you via the control panel, allowing you to tweak the gameplay to your requirements throughout the game. New players may read our guide before they can play the best new slots like this! The reels are full of high paying symbols in this game and the symbols are in keeping with the oriental, warrior theme of the game. You will encounter symbols such as boots, tents, bow and arrows, warrior cuffs, a Mongolian horse and swords, which are all high paying symbols, so keep your eyes peeled for these special symbols. The Wild symbol is one to especially look out for, and the Wild symbol is none other than the Warrior himself. The warrior will try with all his might and strength to help you in battle, by replacing some of the lower value symbols to help you achieve the winning combinations across the active pay lines for victory. The warrior is a high paying symbol on the reel, so he is good to keep on the right side of. The scatter symbol in this game is a decorative shield, but it is limited in its appearance, it will only show up on reels 1, 3 and 5. Once you get a winning combination, the shield will burst into flames, triggering a lucrative bonus feature. When this bonus round starts you will see 4 decorative shields and you have the opportunity to pick a winning shield, which will them determine multiplier symbol you will be granted with and how many free spins you will get. Not only is this game fun to play on desktop, but it is also optimised for gaming on both mobile and tablet too, so you can team up with the warriors and battle for spoils from the comfort of your own home. The animations and graphics in this game are outstanding and an added touch of fun is applied when the confetti is cascaded on the reels when you win. The gameplay is simple but enjoyable, making it a fantastic option for beginners and experienced players. But don't forget that you can also play exciting games like Baron Samedi!